← Denim Again, Maybe Not. It’s the Olympics. Why Not Skate? Back in the early 90’s, there was a great hue and cry that some unscrupulous restauranteurs were selling mutton for lamb. Actually, it was skate for scallops. They would allegedly cut the meat into scallop shapes, cook and serve them to the unsuspecting diner. Unsuspecting, to be sure! Skate, it turns out, is delicious, cheap, has no bones and quite a scallop like sweet flavour. Especially when I let my southern side out for a fish fry. Or maybe that’s the French in me? 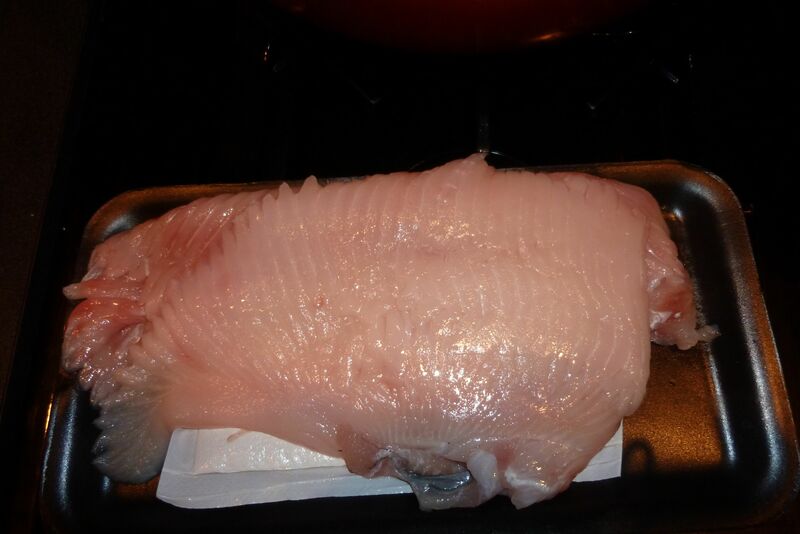 Skate is traditionally prepared in a brown butter sauce. And you all know me, I’m a traditionalist. It is a very easy recipe allowing the cook to errrr… forgive me, I can’t resist … skate through dinner. The results are wonderful and skate will be making an appearance at our table again. I hope soon! 1 pound of skate wing meat. About a stick and a half of butter. Rinse the skate meat under cold water, dry with a paper towel. Salt meat. Heat a skillet over medium high heat for a few minutes. Drop in about half the butter (3/4 of a stick). While the butter is melting, dredge the skate in flour and shake off any excess. When the butter has finished melting and foaming, add the skate to the pan and pan fry for about three minutes a side until golden brown. A fish spatula is invaluable for turning the delicate meat. Remove the fish to a warm oven. Add the rest of the butter, scrape up any browned bits in the bottom of the skillet with a wooden spoon. Brown the butter and add in the capers at the last minute to warm them up. Squeeze a lemon over the fish, sauce with the brown butter and capers. Salt and pepper as desired. Sprinkle with parsley because it’s pretty. I served the skate with a pan fried with Chateau Potatoes just to make sure that the left over butter didn’t go bad. A Pouilly-Fumé or Sancerre would be a delightful accompaniment. This entry was posted in Entertaining and tagged Chateau Potatoes, Pouilly-Fumé, Sancerre, Skate in Brown Butter. Bookmark the permalink. 3 Responses to It’s the Olympics. Why Not Skate? I do agree – skate is very good! I made almost the exact same dish about 2 weeks ago. Did you find your skate at the Yellow Umbrella? I found mine there, and it is the only place that I’ve ever seen it around town. I love the scallop and rich crab flavor, and the delicate but semi-firm texture. Without a doubt this is my new favorite fish, and I plan to enjoy it constantly over the summer. 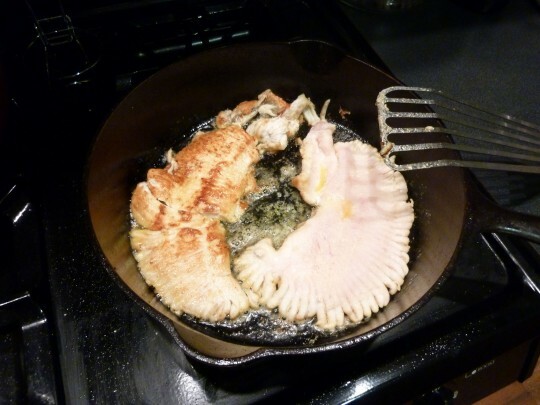 FYI, for any future preparations, I find that skate also works very well with basil for some odd reason. It isn’t a flavor that I typically associate with a light fish, but basil/pesto type flavors meld very nicely when used in moderation. Another ingredient to play with is Pastis… fantastic when cooked with skate. Thank you George, I will take your seasoning suggestions to heart. Yes, under the Umbrella is the only place I’ll buy fish. They do a fine job.